Where to even begin with The Foundation Pit? The author, Andrey Platonov was born in Russia in 1899, the son of a railway worker, and later worked as a land reclamation expert. He was a fervent supporter of the Russian Revolution; during the 1920s he supervised the digging of wells, construction of ponds, and draining of swamps in Soviet Ukraine; he was a war correspondent during the Great Patriotic War. Stalin, who read some of his work pre-publication, reportedly called him “scum” and urged that he be beaten. Platonov’s son was arrested as an enemy of the people and returned from the Gulag with terminal tuberculosis. Platonov contracted the disease while nursing him, and died of it in 1951. Much of his work, including The Foundation Pit, was not published in Russia until the time of glasnost; some of it was not published until the 1990s. The Foundation Pit takes place during the time of the first Five-Year Plan and Total Collectivization. It begins with the mobilization of various people to dig out the space that will serve as the foundation for a gigantic and grand edifice. What should be built is never specified, but the characters are led to believe that it will be shining and splendid, a monumental achievement at the edge of their otherwise unremarkable town. In the meantime, work brigades are rushed here and there, ever more people are brought in for the collectivized effort, even as the available tools remain utterly inadequate for the task at hand. Things get stranger from there. Read as a surreal and symbolic parable, The Foundation Pit is unsettling; read as something more literal, it is even more troubling. It’s also funny in parts, poignant in others, and just plain strange in yet others. Platonov’s Soviet Russia of the 1920s is far, far more alien than Asimov’s New York millennia hence. This is a journey to another world, recognizably human, but seen through the veils of history, language, culture and the author’s own imagination to make it more distant than what is found in much of science fiction. “The reality of life in Stalin’s Russia will always remain hard to understand. No sources of information—no memoirs, no diaries, no reports by informers for the secret police—are entirely trustworthy. It is easier to be sure of the true beliefs of such distant figures as Chaucer and Dante than of the true beliefs of many of Platonov’s contemporaries. Even against this background, however, the degree of uncertainty around Platonov himself is extraordinary. 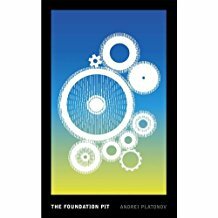 There is hardly a single important work of Platonov’s, or important event in his life, that is not veiled in ambiguity.” (p. 162) The Foundation Pit gets deeper, but no nearer completion.